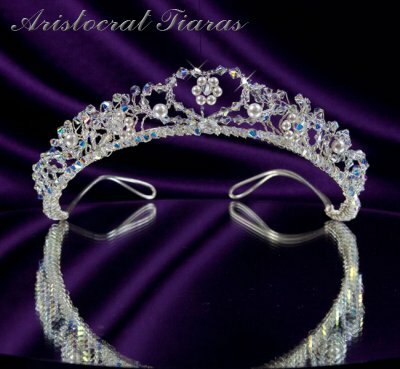 The Countess Regina Swarovski tiara from Aristocrat Tiaras features a crystal heart motif outline with a pearl flower suspended inside. The sides are decorated with more pearl flowers and an exquisite pattern. There are a number of crystals on twisted silver-plated wire stems around the tiara, giving extra body and sparkle to it. This heart warming crystal tiara adds a natural floral beauty to a bride's outfit on the wedding day. Lady Clara earrings and Lady Petunia necklace from our wedding jewellery collection are designed to compliment this crystal bridal tiara. All our crystal bridal tiaras are handmade in Herefordshire UK. Colours and designs may vary slightly from the picture. Ready to ship! This bridal tiara could be with you by 1pm Saturday 20th April (tomorrow).